Image: Plastic Histories by Cigdem Aydemir at Vrystaat Arts Festival (2014). Cigdem Aydemir is a Sydney-based artist strongly influenced by her identity as an Australian Muslim woman with Turkish heritage. Her socially and politically engaged art practice investigates possibilities for intersubjective and transcultural communication with an interest in post-colonial and feminist issues. Much of her work expands on the veil as a culturally constructed site and as material realisation, while exploring the veiled woman cipher as resistant female other and as lived experience. Through the mediums of installation, performance and video art, Cigdem produces engaging and provocative work that is driven equally by research, play, criticism and humour. Cigdem was the 2013 recipient of the Redlands Konica Minolta Art Prize, in the Emerging Artist category, and the Edna Ryan Award for Creative Feminism in 2012. She has exhibited both nationally and internationally receiving support and opportunities from Australia Council for the Arts, Arts NSW, Ian Potter Cultural Trust, Freedman Foundation (Travelling Arts Scholarship), Performance Space (Sydney), Salamanca Arts Centre (Hobart), and Vryfees (South Africa). 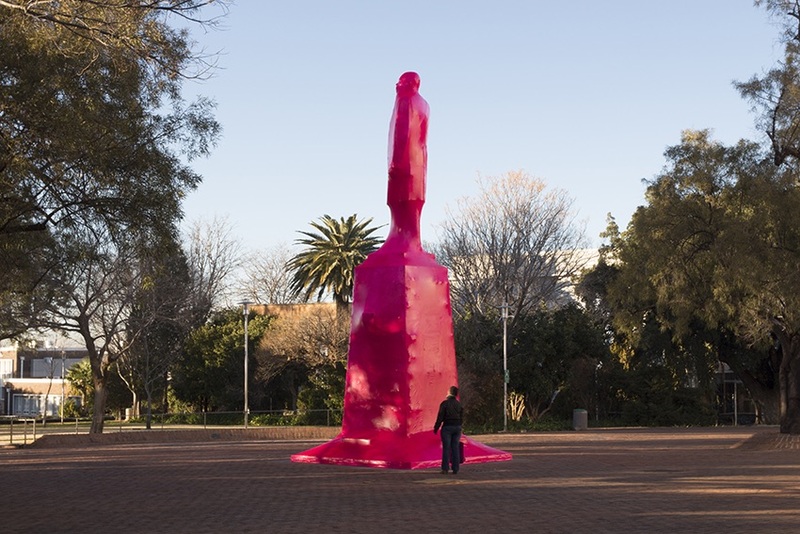 Cigdem Aydemir’s Plastic Histories’ Australian premiere was part of the 2016 Dark Mofo, with statues wrapped in pink plastic in Hobart’s Franklin Square and Parliament Lawns creating interest in what’s under there. Why is it that we don’t notice so many public monuments until they’re wrapped in pink plastic? Plastic Histories was first presented as part of the Vryfees Festival in Bloemfontein, Free State, South Africa in July 2014, the first artist’s commission by one of SAC’s Festival partners coming through SITUATE Art in Festivals Arts Lab 2013. An extension project, Plastic Histories Unpacked, was at Salamanca Arts Centre’s Long Gallery Laboratory and provides a context for the wrapped works with additional information and perspectives. The artist added to the exhibition daily and was pleased to hear public responses to Plastic Histories wrapped and unwrapped. Viewers are encouraged to leave written comments in the Long Gallery. Plastic Histories provides pause to reflect, commenting on the absence of marginalised peoples in histories and as community heroes. In South Africa 90% of the population is black yet 99% of the statues honour dead white males of English or Dutch origin. In Australia, we see high on plinths war heroes and leaders of the colonial invasions. Where are the public monuments to the Aboriginal peoples whose lands were stolen, who fought valiantly to try to retain them, and to the women who endured hardships in new lands.